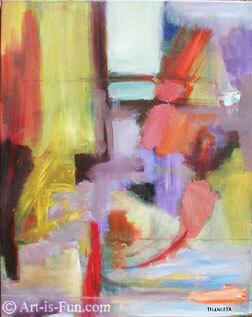 Modern abstract art speaks to the contemporary spirit. The shapes and forms of abstract art vary from artist to artist, who each share their unique inner vision. Let's take a look at several different paintings, all created by the same artist (me!). 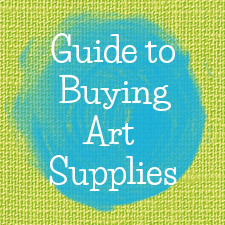 I will show you the vast variety of techniques, styles and approaches that you can use when creating your own abstract art! If you want to paint abstract art and you've never done it before, it helps to identify the style that you'd like to create. How do you want your modern abstract art to look? Some people naturally gravitate towards bustling, busy paintings with lots of colors and details. Other people feel overwhelmed by those styles, and instead prefer the quiet simplicity of a monochromatic color field painting. Below you can see a few of my modern abstract art paintings. Quite different from one another, aren't they! Click each painting below to read a brief description of the formal, stylistic qualities of each artwork. I chose paintings that were sufficiently varied enough in style to demonstrate some of the stylistic choices an artist faces when working on an abstract painting. The main idea of this lesson is to provide beginners to modern abstract art with an overview of the various styles of abstract art, along with a summary of how these styles are created. This small mixed-media abstract artwork was made using watercolor pencils and acrylics on an Ampersand Aquabord. The first step was to use Colorless Art Masking Fluid to draw (with a brush) the white symbols. 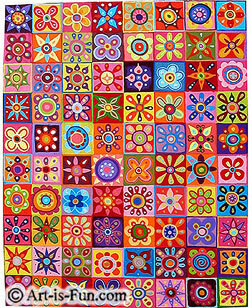 The colors were laid in a patchwork fashion using watercolor pencils. The watercolor pencilled areas were then moistened to create a soft hazy effect, while retaining the graininess of the pencil. Once this dried, the masking fluid was removed, revealing the original white surface underneath. A few black shapes and lines were added with black acrylic paint, to balance the white areas. This painting displays a dynamic interplay between the colorful hazy patchwork and the crisp shapes - a whimsical concoction! 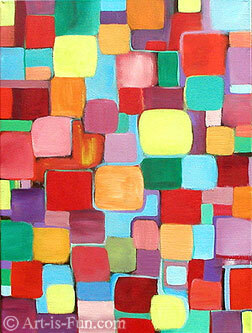 This modern abstract art painting was created using acrylics on canvas. The outlines for the blocks were drawn quickly in charcoal, allowing room for adjustments before applying the paint. Using my knowledge of colors and how they interact when placed next to each other, the colors were chosen purposely (though without preplanning) to create a painting in which the colors seem to visually pop off the canvas. The overall desire was to achieve a balance through variety in terms of size and color, while maintaining a sense of active simplicity. This painting was done in an Abstract Expressionist painting style, meaning that nothing was planned beforehand and it all arose spontaneously. I always hate to waste paint and I try not to when I can. So when I have leftover paint at the end of the day, I quickly slap it on a canvas. That was how this painting began. Once it started to get interesting, I added some texture with Light Modeling Paste. In some areas I used the end of my paintbrush to scrap lines into the texture. The modeling paste muted the colors underneath and allowed for more colors and shapes to be added on top. This painting incorporates a variety of brushstrokes, such wet-brush, dry-brush, blotching, and dripping. The paint was applied in an intuitive manner, using my knowledge of composition to continue adding and subtracting elements until the painting felt balanced. This funky abstract painting was done using acrylics on canvas. 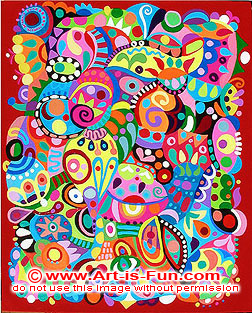 This vibrant and wiggly work of art was created by first the sides of the canvas were painted red. I painted in some shapes next to each other in different colors, working in one color at a time. 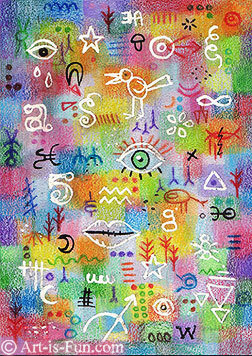 Once the surface of the canvas was filled with colorful shape, I painted smaller shapes and designs on top. The designs were intuitively drawn in using paint, then even further designs were painted over top, in an additive manner. No pre-planning involved! 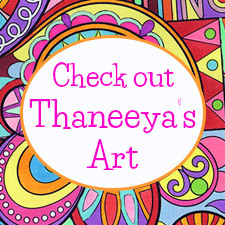 You can see and read all the steps on how to create this funky abstract painting here! The colorful floral abstract painting was created using acrylics on canvas. The squares for this painting were carefully measured out using charcoal. Next the background colors for each square were filled in. Then the flowers were painted in, piece by piece. 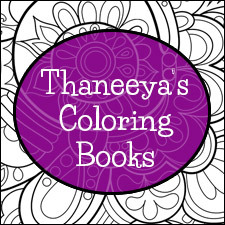 For example, I worked in one color at a time, so I would put blue petals in one square, a blue circle in another square, blue dots in another square, etc. The painting was done in an additive, layering process. The designs for the individual flowers were not pre-planned. The colors were chosen at the spur of the moment, based on my knowledge of color, to create a painting in which the placement of the colors would cause the viewer's eyes to bounce around the canvas. This painting was done in an Abstract Expressionist style, using acrylics on canvas. The colors and brushstrokes were chosen intuitively, without any preplanning or any preconception of how the final painting might look. The painting was continually worked on until it 'felt' complete. Colors were added and others were covered over. In the process the composition was continually adjusted until the painting reached a certain dynamic balance. Techniques to create this painting include both wet and dry brushing, as well as dripping. This modern abstract art painting was created using acrylics and texture medium on canvas. A layer of texture medium was first applied, consisting of a mixture of Ceramic Stucco and Light Modeling Paste. Once on the canvas, the mixture was scraped through with several imperfect parallel and perpendicular lines. This formed the compositional foundation for the painting. Hazy washes of color were painted over, then a few finer details were added. The aim of this painting was to create a piece that was elegant and quiet, yet retained a sense of offbeat quirkiness touched with tiny bits of dainty charm. 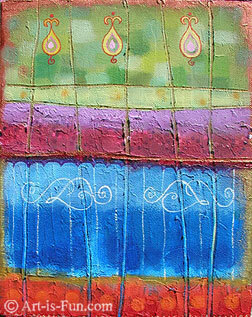 This modern abstract art painting was created using canvas panel, which was framed within a handpainted wooden frame. This is an example of one of my rare paintings that involved preplanning. 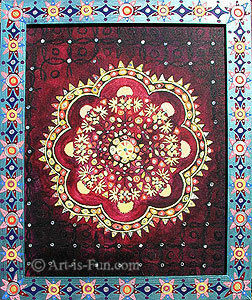 The central design was derived from a motif in Indian tribal art. Careful planning (involving a ruler and pencil) ensured that the design was balanced and accurate. After everything was drawn in correctly, paint was added. The wooden frame was completely separately but in the same manner. I used a metallic blue paint for the background of the frame, to give it some extra pizazz. I hope that the above artworks and descriptions were able to give you an idea of the different ways an modern abstract art painting can be created! The abstract paintings above were all created by me throughout a 6 year period. During this time I experimented with many different art forms and processes. 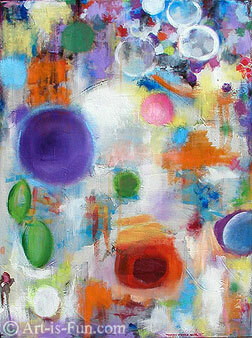 You can see more of my modern abstract art on my website!